Billie Joe Armstrong is an American rock musician and occasional actor, best known as the lead vocalist, main songwriter, and guitarist for the American punk rock band Green Day, which he co-founded with Mike Dirnt. He is also a guitarist and vocalist for the punk rock band Pinhead Gunpowder and provides lead vocals for Green Day's side projects Foxboro Hot Tubs and The Network. Check out the gear this punk rock legend has been spotted with throughout his decades of performing and recording. What kind of Guitars does Billie Joe Armstrong use? Click here to let us know! The tech then confirms that Billie Joe Armstrong uses this guitar to perform Green Day’s older material live, which is all Eb. He also confirms that guitar is strung with Ernie Ball .010 - .046 strings. Blue's official model is a Fernandez LE-1 - probably dating from 1987 or 1988. The official color is "Sonic Blue" - which is the same one Fender Japan used on their guitars as the guitar was manufactured by Fuji Gen Gakki (whom made Ibanez and the Fender Japan instruments). "This junior is done! Billie wanted a heavy relic, but we all decided it looked so good I went very moderate with it. Some chips, dings a little arm wear but well cared for 54 junior. Lots of finish checking though. This guitar sounds great, sustain for days. #billiejoearmstrong #greenday #customguitarfinish #guitars #electricguitars #gibson #54lespauljunior #relicguitar #refinishinnitro #luthier #rothmetalflake #absupply #relic #schroomcustomguitarworks"
Armstrong has been using this guitar, which seems a lot like his "Floyd" Les Paul Junior. He played this guitar for "Acoustic-4-A-Cure" concert, done in 2014. This is the backup guitar for blue, its a blackout telecaster with a slanted Seymour Duncan SH4-JB. It matches the specs of blue, maple neck, solid body , slanted/same pickup, and has one volume knob. It has got a fender tele deluxe pickguard, made by WDMusic. When Hans ( Billie's guitar tech) buys the pickguards, he asks a 3 ply tele deluxe pickguard, and does the routing by himself. It wasn't really used much live, he actually gave a lot of those away. Surprisingly, he played the whole Reading 2013 show with this guitar. This Squier guitar was give away by Billie Joe guitar tech Hans in backstage after audience get Billie guitar in stage. This guitar was used on 21st Century Breakdown, as Billie Joe says in this Guitar Player interview. "I also got some great sounds with my ’52 Fender Esquire though a Divided by 13 combo—we used that amp a lot on this record." In this photo, Billie Joe is playing Gretsch G6123 model. This guitar was also used for Trilogy recordings, and it can be seen in a lot of short videos uploaded from Green Day. The Gibson Les Paul Junior 1956 Sunburst Electric Guitar is used by guitarist Billie Joe Armstrong of the world-renowned rock band Green Day. Billie Joe named this guitar "Floyd," which served as the inspiration for his signature Gibson model and remains his favorite guitar. In an interview for Guitar Player he also notes that this guitar was used for recording "21st Century Breakdown". "I mainly played a ’56 Gibson Les Paul Junior, but I also had a Slash model Les Paul, a Jimmy Page model Les Paul, and my ’59 ’burst." "For me, I think that, you know, Les Paul Juniors have more of a rock 'n roll sound just because it's the true sound of a guitar. The sound that I go for is that real punchy mid-range kind of sound." Gibson's website describes this artist guitar, "In honor of Billie Joe’s achievement in taking the punk ethos, attitude and energy right to the top of the mainstream without once compromising his vision, Gibson USA presents the Billie Joe Armstrong Les Paul Junior Double Cut, a great partner to the original single-cutaway Billie Joe Armstrong Les Paul Junior, and a guitar that is primed to get you straight into no fuss, no frills rock ’n’ roll. Designed in the image of the late ’50s rendition of the breed, the Billie Joe Armstrong Les Paul Junior Double Cut is crafted with select tonewoods and an advanced rendition of Gibson’s hallowed P-90 pickup, the noise-cancelling H-90, with a double-cutaway body and subtle custom graphics to help it stand out from the crowd, and includes an extra special new Gibson gigbag with a stylish surprise lurking inside." This guitar was also used on famous iHeart Radio festival, and it was smashed later. Armstrong, frustrated with his set cut short, smashed this guitar. He later posted to Instagram the rebuilt guitar, which he later used on Trilogy tour after his comeback. 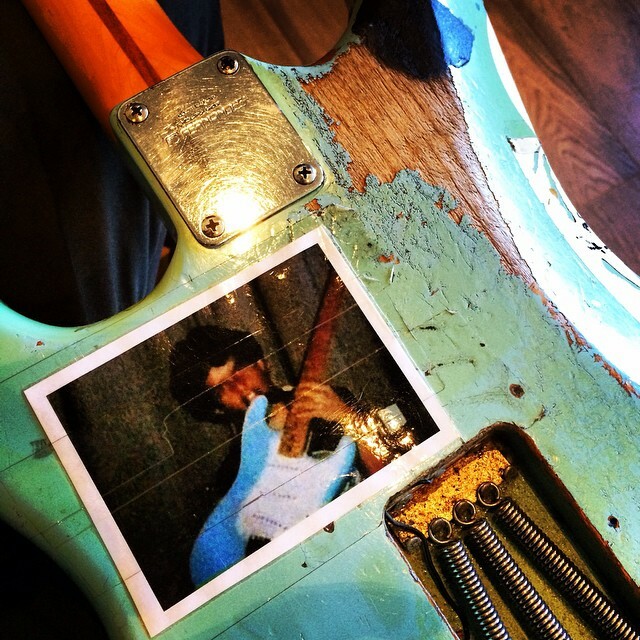 This guitar was rebuilt by Billie Joe's guitar tech, Hans. Billie Joe Armstrong, frontman for punk rock band Green Day, is seen using a red Gibson ES-135 Electric Guitar in the music video for the song Redundant. In the "Heart Like A Hand Grenade" documentary, at 4:00 minute mark, Armstrong is visible using this guitar for "Jesus of Suburbia". Green Day's guitarist and singer, Billie Joe Armstrong, often used a red Gibson SG Standard Electric Guitar during shows. Red Gibson SG Standard was mostly used on TV appearances for "Warning" era, as well as live shows. He played "Waiting" with this guitar on Jay Leno show. Second Gibson SG Standard he was seen using, was on the appearance on Hotel Babylon, which was in 1996, to be precise, on 27th of April, 1996. This guitar is rumoured, as well as the whole equipment in this show, to be borrowed from the Living End members. But actually this guitar was owned by Billie. You can see this picture with his son playing Gibson SG Standard. "We just picked this one up on eBay from a guy in Pennsylvania. It's a Martin GT-70. I guess it's a guitar they made around 1967-1968 just for a few years in the mid 60s. It's alright, it's a bolt-on neck guitar, so it's a little different than what they're known for acoustics. It's quite an oddball, but it's perfect for our needs. All I've had to do on it is a fret level on it, and a neck press because the neck was way too straight since it would just buzz on the first five fronts," explains Hans, the guitar tech for Billie Joe Armstrong. "The J-180 is a fantastic live guitar. You know people say that the extra pick guard kind of dampens the tone and so forth, but I think for live it's great. And also I think the Everly Brother's dad designed the bridge with the strings, which barely break over that bridge. That means you never have to worry about strings breaking. It's a very nice guitar," says Billie Joe Armstrong's guitar tech, Hans, about the Gibson Billie Joe Armstrong J-180 Acoustic Guitar, used during live Green Day performances. J-180 is heavily used for live performances, especially 21st Century Breakdown tour. 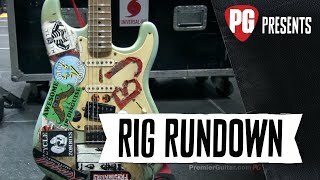 Billie Joe used this guitar to play "Macy's Day Parade", "Redundant", "Words I Might Have Ate, Good Riddance and Give Me Novacaine", and other stuff. Billie Joe Armstrong's guitar tech says, "He loves playing this thing." Rickenbacker 360 was used mostly for the Trilogy tour, and he played "X-Kid" with this guitar. He used this guitar (or maybe the different guitar of the same making) to record some parts on "Revolution Radio". "Another underlying thing on a lot of parts is a Rickenbacker 360—like the ones Peter Case and Peter Buck use—through a Divided By 13 head. Those guitars are so punchy. I was going for something that was in between Paul Weller, Steve Jones, and Johnny Thunders, while still trying to find my own sound. And then, for a bigger, more heavy sound, I’d run a Les Paul through one of my Marshalls."  - Guitar Player interview. 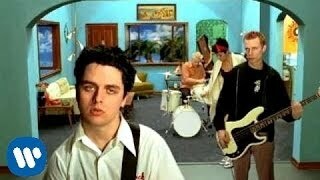 In Nimrod era, Billie Joe start using Fender Custom Shop Stratocaster for playing all song from Nimrod in E Standard. In 1997, Billie Joe order 3 "Blue" replica and other it's customized Stratocaster called "Frankenstein" (which can see on 1998 MTV New Year Eve's), There all guitar was smashed/gave away, built by Alex Perez. He built three "Blue" copies for Billie Joe, and neck of "Blue" it's abandoned on tour bus closet, Billie Joe never use that neck and listed on eBay, since that, Billie Joe changed the "Blue" neck. this guitar no longer used since 2000. Played during the 2000 Live In The Bridge School gig. He played this guitar for only one ocassion - the MTV Live show, done somewhere in early 00's or late 90's. This guitar was used for "Good Riddance (Time Of Your Life)", and "Redundant", which was the same show. Even though this has been rumoured to be a backup acoustic guitar, this guitar was actually used to record "American Idiot" album. In 5:30 mark of this video, this guitar is seen. In this video, Rob Cavallo explains how his Taylor 514C was used for recording of "Good Riddance (Time Of Your Life)". That isn't the only hit that was made with the guitar. Songs like "Iris" by Goo Goo Dolls and "Second Chance" by Shinedown were also recorded on this particular guitar. It's in 2 colors. (white, cherry burst) You can see white one in the Kill The Dj music video. Cherry burst guitar is in Armstrong's inventory since 99 revolutions tour. He's using this instrument since they played in Echoplex 2012. It's a Billie Joe Armstrong signature Les Paul Junior made by Gibson (black) wich was 'repainted by an artist in the bay' as described by Billie Joe's tech in the premier guitar rig rundown. The single kluson tuners show that the guitar is one of the "newer' signatures as Gibson used Kluson strip tuners when they started making the signature but later switched to singles. He used this guitar at Reading 2013, but he smashed it almost immediately because the guitar went out of tune. He used this guitar solely for "Waiting". At 0:14, Billie play with Black Telecaster. Copy of Billie Joe's famous "Blue" Stratocaster used during touring in 1997-1998. Billie Joe Armstrong's gear is on Equipboard.